Happy Friday, lovelies! What a crazy week I've had. Let's just say I'm glad it's in my rearview. Thankfully, the weekend is here AND I have a special treat for you! Friends, I'd like for you to meet Majestical Jewelry. A few weeks ago, Majestical Jewelry contacted me and asked me share their gorgeous jewelry with my readers. Jewelry is one of my favorite things to shop for so naturally, I was over the moon at their request! 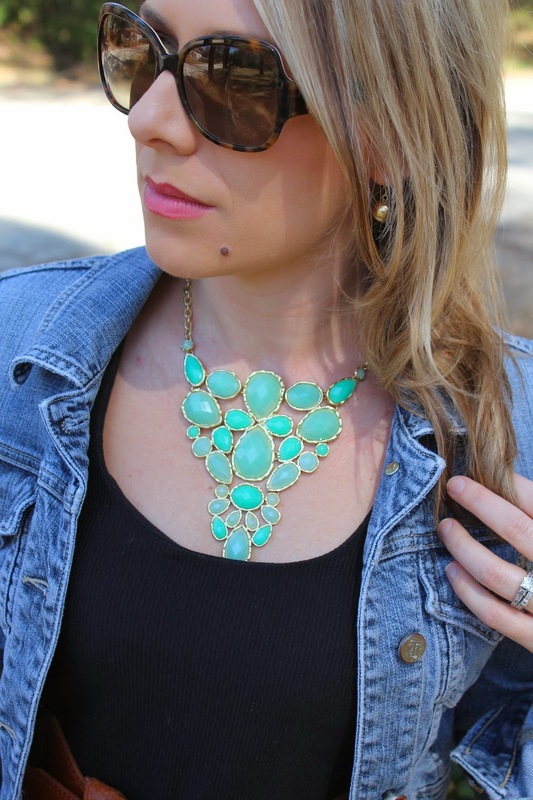 This necklace is perfect for spring as it brightens up any outfit. I can tell it will easily be a favorite of mine this spring and summer. I chose to pair it with one of my fave black dresses and since it was still a bit chilly out, I layered with an old denim jacket and boots. I also couldn't help accessorizing with a cute little pup who was so curious about the camera...until he got in front of it! Now for the best part of today's post...Majestical Jewelry has agreed to give one lucky reader a necklace just like the one I'm wearing! Pretty awesome, huh? Check out the deets on how to enter below. Entering is easy so listen up...All you have to do is leave a comment below telling me how you would style your very own necklace and be sure to leave your email address. While you're dreaming up the perfect outfit, hop on over to Majestical's website and check out their new spring items. They are adding lots of new items that you don't want to miss! I'm loving this bracelet and these earrings! For additional entries, like the Social Sara and the Majestical Jewelry Facebook pages or follow me on instagram. Just be sure to leave me an additional comment for each. Giveaway will end at 11:59pm EST on Friday, March 28th, 2014 and is open to US residents only. Winner will be notified via email. Here's wishing you a lovely St. Patrick's Day weekend! What are you doing to celebrate? Cheers! I think I would pair this with a crisp white pop-over, a great pair of denim, and a killer pair of flats. I'd want it to be all about the necklace! I like SS on facebook! I like SS on instagram! Lets see, I am thinking white strapless dress, gold jack rogers, and a tan! I am already in a Spring/Summer state of mind can you tell? I would pair it with a fitted tee and high-waisted skirt for a casual, chic look. I follow Social Sara on FB. I follow Social Sara on Instagram. It's looks gorgeous on you Sara and I love what you chose to wear with it! I think I'd pair it with a cute and relaxing knit maxi in maybe a stripe. Thanks for the opportunity to win it. I'm following you & Majestical Jewelry on fb as Tracy Suzanne. I have a black and white dress this would look great with. I like you on FB as deanna lynn. I like them on FB as deanna lynn. I follow you on instagram (deannalw47). PS That dog is so cute! I would wear this with some jeans and a cute blouse. That way it would casual, yet chic!